These are absolutely gorgeously deep and dark small beds of Uruguayan Amethyst, all AA Grade, and all with a gorgeous deep purple colour ! Really good quality pieces and at a great price too ! Amethyst is perhaps the most well known of all crystals and has strong healing and cleansing power making it an extremely important, almost all purpose, crystal. 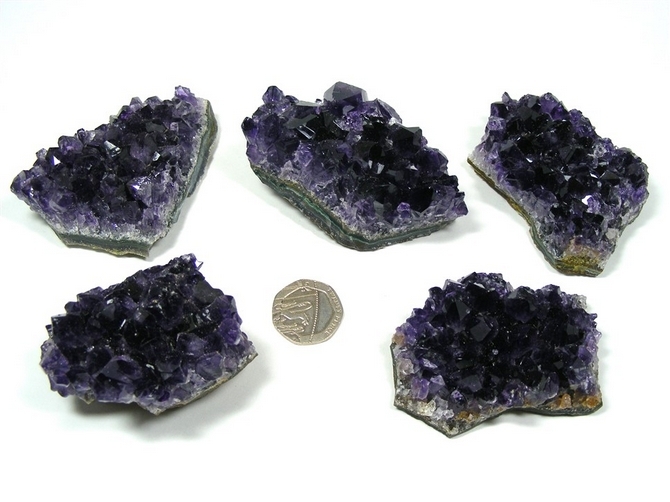 Amethyst is very helpful to us if we are having trouble in sleeping. It is extremely useful with migraines and headaches and can help with hearing disorders too. Amethyst strengthens the skeletal system and reinforces proper posture. It stimulates and regulates the endocrine glands and helps with disorders of the nervous system, digestive tract, heart, stomach, skin and teeth. Amethyst is also useful in treating the lungs and the respiratory tract. Amethyst brings to us a sense of peace and contentment. It is a crystal with a calming effect. It reduces anger, rage, fear and impatience. It can promote inspired dreams and dispels nightmares. Amethyst helps to enhance our memory and stops us being anxious about things. Amethyst is useful for cleansing the aura and for absorbing any negativity. It is a very comforting crystal to have by us during periods of sadness, stress or bereavement. Amethyst is one of the most spiritual crystals there is. It promotes a love of the divine and encourages spiritual wisdom. Amethyst also promotes our sense of spiritual awareness and contentment and, during meditation with Amethyst, we can be lifted into higher states of consciousness which allow our finer perceptions of things to become clearer. Amethyst also helps us to understand things at a deeper level when we meditate with it. Our psychic abilities are also enhanced with Amethyst.